I admit, it’s been a while. I got caught up in my real world life, final exams, and starting a full time job. To whoever has been linking to me on Pinterest, you are amazing and I am so grateful. Somehow in my absence my blog got more hits than ever. Does this mean that you guys like it better when I don’t talk? …well tough luck, I’m in a chatty mood. I’m back with TWO recipes for you today. The first one I had seen pictures of on Instagram and knew I had to recreate. 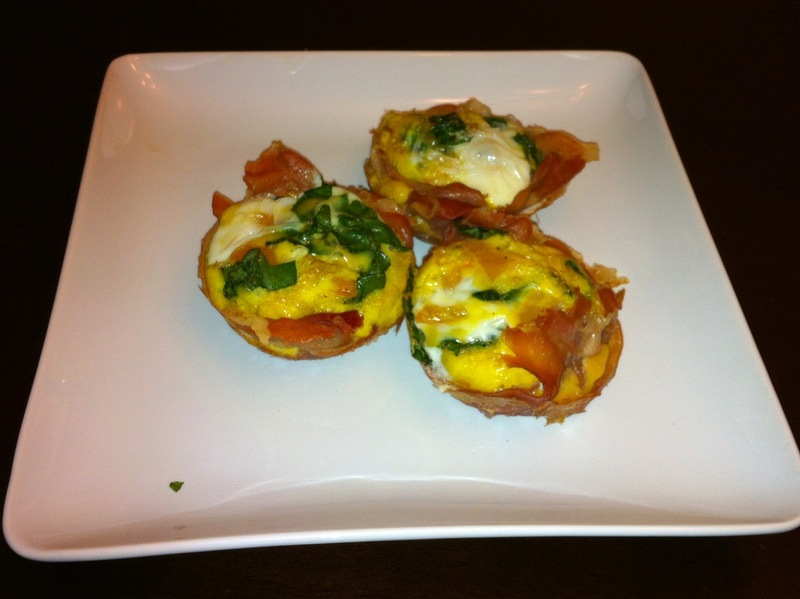 If you are looking for another breakfast food to make ahead of time and eat on the go, this is definitely for you. 4. Bake in oven for about 25 minutes on 350. These were so good and did not last long before they were gobbled up. The saltiness from the prosciutto is truly addicting. Tonight I also made stuffed peppers, which are super quick and easy and great to make ahead of time for lunches or dinners. 1. Cut bell peppers in half, leaving the stems up scooping out the seeds. Place open side down on a baking sheet with a bit of coconut oil on them and place in oven at 350*. 2. Put chopped onions in saucepan with 2 tbs coconut oil. Cook on medium until translucent. 3. Add beef and garlic and chili powder (optional, but you know I like things spicy), stir until the beef starts to brown. 4. Add basil and tomato, cook until all meet is brown. 5. 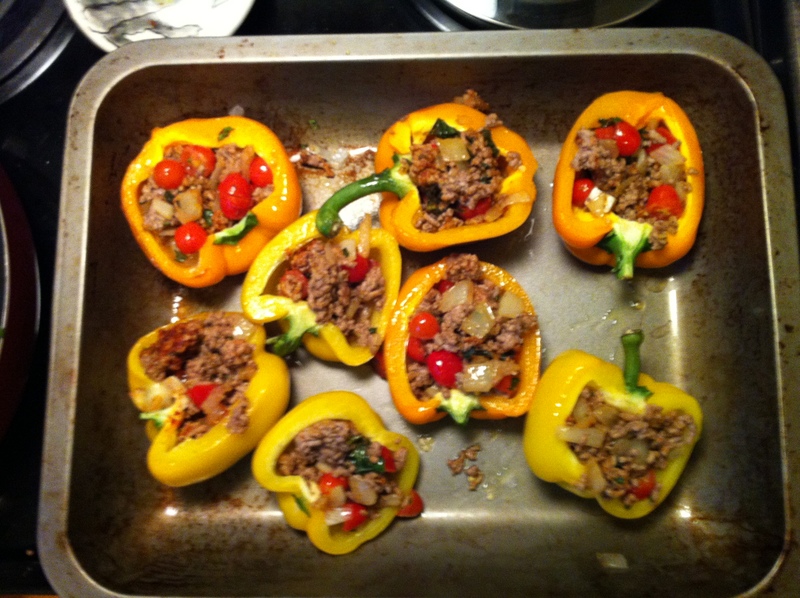 Remove peppers from oven, scoop beef mixture into peppers. 6. Put back in oven for about 15 minutes or until it is cooked to your liking. 7. I also roasted jalapeños (just cut them up and threw them on a baking pan) and mixed these in after the fact. Added even more spicy flavor if that’s your thing. Today I signed up for a new gym, with my work paying for a good portion of my membership fees. I’ll be able to go over during lunch and work out, or after work to avoid rush hour traffic. The gym is super nice and I can’t wait until tomorrow to check it out. Does that make me a little crazy? Maybe, but I don’t care. Also, I found a Paleo Food truck! They were just shutting down for the day, when I discovered them so I couldn’t get any food. BUT I chatted with the guys a bit, who were super friendly, and I’ll be reviewing their food tomorrow for anyone who lives in the Denver Area! love, love, love both recipes! yum! and so jealous you have a Paleo food truck around!